Play Megasaur free this August at Silver Sands Casino by claiming a 200 ZAR bonus with an exclusive bonus code. SilverSands Casino is heralding the launch of its new Megasaur slot by hosting a special August promotion to celebrate. The deal on the table will let players claim 200 ZAR in free bonus funds to experience the slot game first-hand. 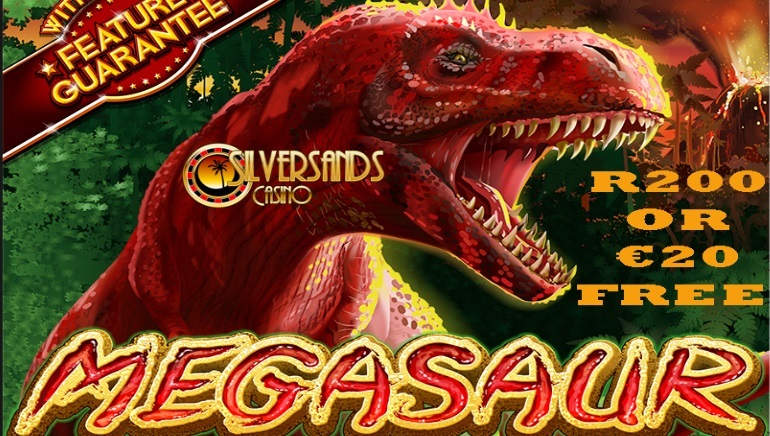 Now is the perfect opportunity to try out Megasaur at SilverSands Casino. To unlock the free bonus funds, players must first log in to their SilverSands Casino account. The next step is to head for the cashier to complete the process, which is simply a matter of entering the coupon code MEGA200. That code has to be entered by Sunday 31 August or else the funds will not be released – there’s still plenty of time to claim. Prior to using the casino bonus funds, players should be aware of a few basic conditions. For starters, the 200 ZAR is only intended for use on the Megasaur slot and cannot be wagered on other slots or casino games. Wagering has been set at 60 times the bonus funds and it is possible to claim winnings worth up to twice the bonus funds, which equates to approximately 400 ZAR. For access to all of the competitive offers available from SilverSands, the only solution is to become a new player. This will prepare you for the Megasaur deal plus the many others that can be expected over the coming months. Make a first deposit to unlock up to 8,888 ZAR in bonus funds for your new account.